Today, organizations of all sizes operate under competitive and economic pressure to improve customer experience, while trying to cut costs and increase efficiency. Neopost’s OMS-500 enables you to address these challenges and easily produce enriched, personalized and secure customer communications. 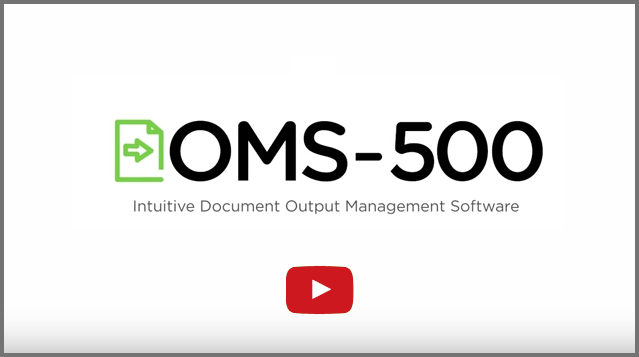 OMS-500 gives you complete control over your customer communications processes by automating and centralizing the preparation of your business documents. It’s all that you need to create compelling, personalized communications and deliver them to the right person, at the right time, through their preferred channel. Neopost’s OMS-500 allows users to define which document should go into which envelope. It can sort and collate documents to avoid sending multiple items to the same recipient, and it secures the content of each mailing piece using intelligent inserter barcodes. OMS-500 was designed to enable business users to easily manage their customer communications, with simple access via their web-browser. It's easy to configure to meet your specific requirements and standards without changing source applications or requiring major IT involvement. Its web-based intuitive interface offers instant feedback on various jobs and allows users to define and run new document configurations. Neopost’s OMS-500 allows you to access and use content to create a better experience for your customers and turn your communications into engaging documents and increased revenue opportunities. Adding personalized marketing messages, overlays or enclosures to a document has never been easier. OMS-500 helps you maximize the impact of each customer communication piece and improve customer satisfaction. Neopost’s OMS-500 offers centralized user administration and distribution, enabling communications to be produced by different departments, at different times and in different geographical locations across your business. It also enables you to communicate with your customers via the channel they prefer. With OMS-500's built-in multi-channel capabilities, businesses use one single platform to produce and deliver digital or print documents. OMS-500 integrates with Satori Software to provide address correction and presort capabilities, to avoid undeliverable mail and optimize your postal costs.